A refracting telescope uses two lenses to minimise the image and send it to the eye. The lenses must be separated by the sum of the focal lengths of the lenses. A reflecting telescope uses a curved mirror to focus the light and a lens to minimse the image. 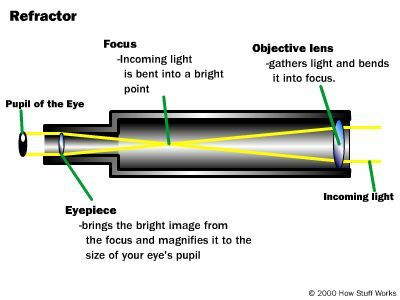 Its advantage is that it can be much smaller than a refracting telescope but the disadvantage is that you lose some of the image because of the space taken up by the secondary mirror.